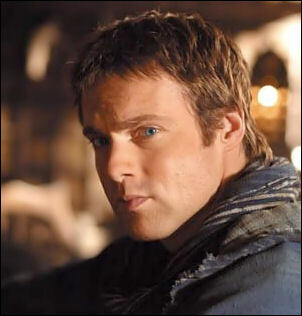 Fans of Michael Shanks, who played archaeologist Dr. Daniel Jackson in Stargate SG-1 from seasons 1 through 5, are in for a big surprise when season 7 premieres this summer. At the end of the show's fifth season, when he made the decision the leave the series, Shanks found himself dead center amidst a fan uproar. But, as with all things in the Stargate SG-1 universe, nothing is ever truly gone forever. And, in a surprise coup, the beloved actor has rejoined co-stars Richard Dean Anderson, Amanda Tapping, Christopher Judge and newcomer Corin Nemec for more journeys through the Stargate. As fans rejoice, the Sci-Fi Newsletter caught up with Shanks three weeks prior to beginning production again in Vancouver for an all-new season. In this first part of our two-part interview, Shanks discusses returning to the long-running series, his relationship with his dedicated tribe of fans, and pre-season thoughts as the company gears up for production. . .
SCI-FI NEWSLETTER: How does it feel to be back? MICHAEL SHANKS: It feels good. The fan reaction was very flattering when I left. . .and a bit shocking. And with me coming back it's equally flattering and shocking. Very positive feeling. SFN: During your hiatus, did you have memorable fan encounters? MS: I think there were some particularly emotional occurrences. There was a lot of mail that was part of the flattering and shocking category when I realized how people emotionally attach themselves to characters on television and look at them as driving forces behind their own dreams and ideas. It can be very emotional when you have some mother telling you that you're the idol for her son because he gets teased for wearing glasses at school, and she shows him my character on television and says, 'even guys with glasses can be heroes too.' Stuff like that, where you just go, ah, tingle crush. Things like that can rip your heart out. And, again, you do sort of wonder if, 'oh no, those kids are not going to have that character anymore.' It does hit some emotional cores. SFN: What led to you want to come back? MS: Without going into too much detail in terms of the business and creative side of it, I'll just say that the reasons that I left are not the reasons why I'm coming back. They're two separate situations, and I'm walking back into a different situation that's much more acceptable than the one which I left. The bottom line is, I don't think there was any bad blood between myself and the production people, except in theory. And, once we actually sat down in a room and talked over some things, those things were resolved instantaneously. So, the situation I'm coming back to is a bit of a unique circumstance from the one [in which I left], and that's the main point. Nobody bent over backwards; MGM wasn't over a barrel, nor was I coming back with a cap in hand. It was more like the situation changed and they said, 'hey, what do you think about this?' And I said, 'well, that's better.' And it's as simple as that. For me, on a more personal level, I would say the acceptance of the character and the expression of sentiment towards the character was a factor in me deciding to come back. SFN: Did you call other cast members to tell them? MS: They actually called me. I was away when I was asked back. I was in South Africa at the time, and I wasn't in contact with too many people in North America. And by the time that I had worked out a deal with the corporation there had been some sort of article in the local newspaper about it, and I don't think either Stargate publicity or MGM publicity had any hand in it. I think it was strictly some journalist following the story and finding out some inside information, so I was getting phone calls from a lot of people saying, 'What? Are you back on that show? What's going on?' And my castmates placed some phone calls towards me saying, 'What the hell is going on?' They had heard through the grapevine that that was going to be the case. So, I think there was a general expression of joy and rapture and bliss and family happiness and sentiment expressed from the other cast members as well. SFN: When you returned to the Stargate set during season 6 (for episodes "Abyss," "The Changeling" and the season finale "Full Circle"), what was that like for you? MS: I did three of them this year. It was all very positive experiences. It was kind of like I hadn't left. It was kind of frightening, actually. But it was a very positive experience for me because one of the problems, as you probably know, of being in a place all the time, full time, you get weighed down by negativity, and you get mired in the bull that happens that is oftentimes out of your control. And, when you do just pop back in, all you get is the positive. You get the people that you missed. You missed them and they missed you. And, when the edge gets off, when the novelty wears off, when you're there for a long time, you just get in and get out. You don't have to dwell on anything. You get all of the positives and none of the negatives. So I had a hoot. Every time I went in, it was just like all I got were the positive parts. And it was wonderful to see my friends, and to go away and do other stuff and come back. In a lot of different ways it was an ideal scenario. SFN: Have you started production on season 7 yet? MS: We're about three weeks away from actual filming, but I am going to be writing an episode this year, sticking my own neck on the chopping block, so it balances the tables. I have had a meeting with the writers; I have had a couple of talks with Rob Cooper, the show runner this year, and we've had some discussions about which direction the character is going. Last Friday I had a meeting with the writers and they outlined some of the stories that are coming up and in what directions the character will be going, and [asked me] if that was ok, if that was cool. It's nice to be in that mix because there's a lot more back and forth. When it's just the actors, you get the lay of the land for the season. I think one of the parameters, too, of making this year a positive experience for everyone is [to have] a little bit more open lines of communication. I think that's being done.